The park is open 8 AM until sunset 365 days a year. Driving Directions Located in Santa Rosa Beach 10 miles east of Destin, FL. Take Interstate 10 to Exit 14 (Defuniak Springs) and follow U.S. Highway 331 south. Travel 27 miles to U.S. Highway 98. Turn right and travel approximately 5 miles west to scenic Highway 30A. Turn left and go ¼ mile to the entrance on the right. 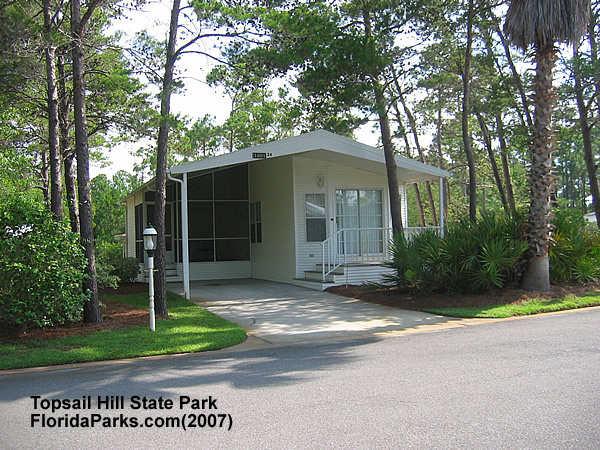 Topsail Hill Preserve is named after Topsail Hill, a high, picturesque dune standing 25 feet above sea level. The preserve is home to one of the last two remaining natural populations of the endangered Choctawhatchee Beach Mouse. 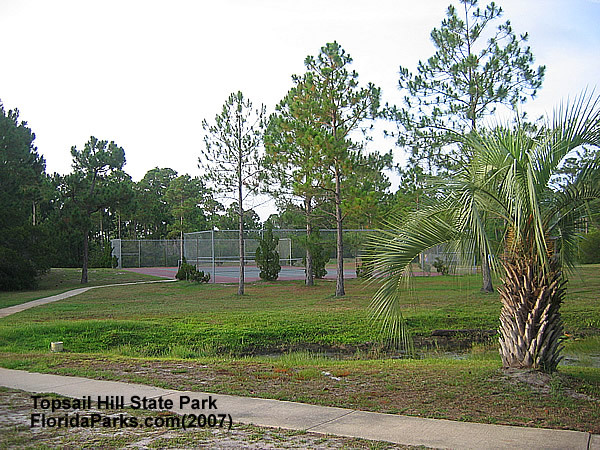 The park has 14 natural wild plant communities from beach dunes to pine flatwoods. 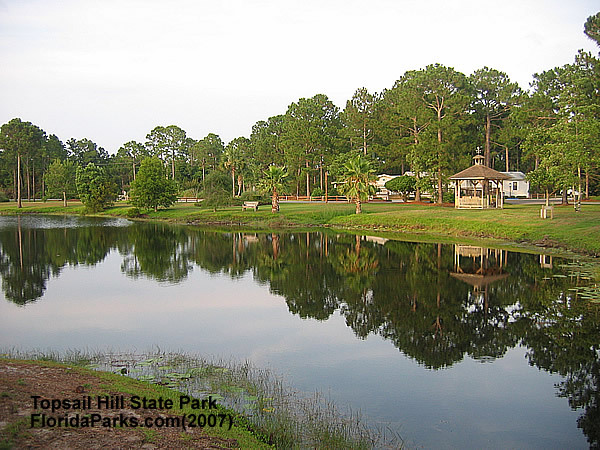 Coastal dune lakes, wet prairies, and maritime hammocks are rare and unique communities found in this park.Volunteers are recruited to assist with various park activities including construction, trail maintenance, sea turtle nest indexing, and campground hosts. 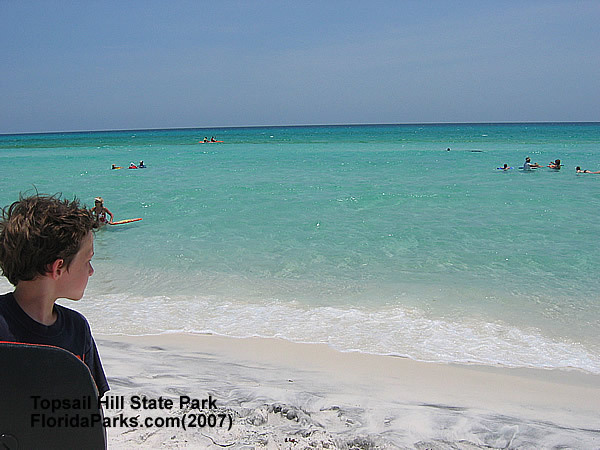 Beaches, Bicycling, Full Camping, Cabins, Fishing, Nature Trails, Picnicking, Scuba, and Swimming Beaches High, picturesque dunes provide the perfect backdrop to the undisturbed three and a half miles of pristine white quartz-sand beach along the emerald waters of the Gulf of Mexico. Surf fishing, swimming, sunning and wildlife observation are popular. The tram system, which takes you to the beach, is a mile ride through a beautiful forest. 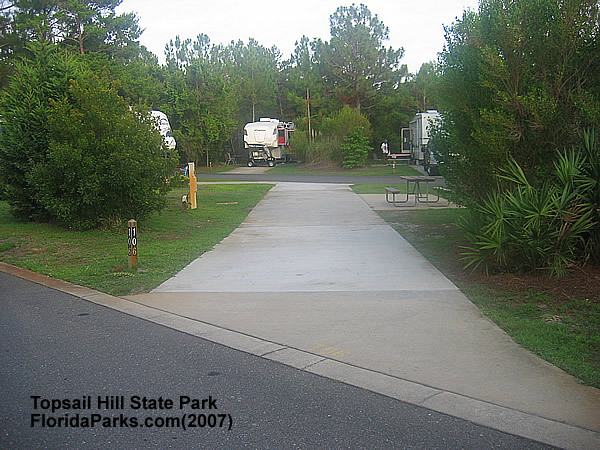 Bicycling Bicycling and roller blading are possible on our 2 miles of paved roads within the RV Resort. 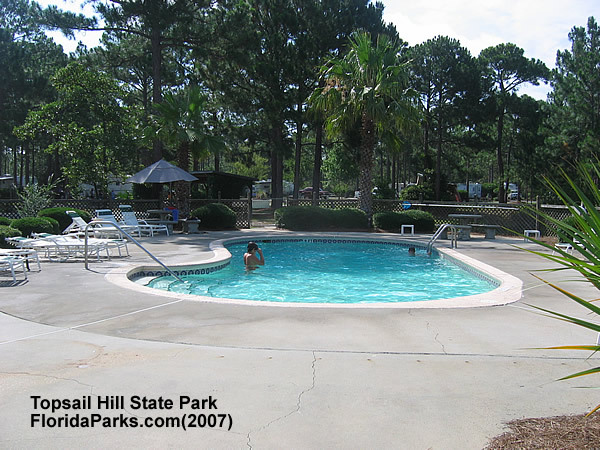 Full Facility Camping This 140-acre RV Resort has 156 sites with sewer, water, electric, cable, heated swimming pool, shuffleboard and tennis courts and beach access. Our bathhouses are heated and air-conditioned. Big rigs welcome. Cabins There are 14 bungalows in a small neighborhood setting with beautifully landscaped lawns and natural setting of the preserve out the backdoor. Each bungalow has a carport, full kitchen, bathroom, bedroom, living room and utility room. All are completely furnished. Other amenities may include screened-in porches and a den. The swimming pool, laundry facility, clubhouse, and country store are easily accessible. Rentals are from one month to six months. Fishing Freshwater fishing in 6 lakes. License required. Saltwater fishing available in the Gulf of Mexico. Nature Trails The park has maritime nature trails located south of Morris Lake which traverses ancient dunes and scrub communities. The trail is 2.5 miles in length. Picnicking Picnic pavilions are located at the south end of Topsail Road. Swimming The emerald green waters of the Gulf of Mexico provide visitors the opportunity to swim in a saltwater environment. No lifeguard protection is provided.